Product #20633 | SKU 1SKB-H4812W | 0.0 (no ratings yet) Thanks for your rating! Designed specifically for transporting mic stands, drum hardware, etc. 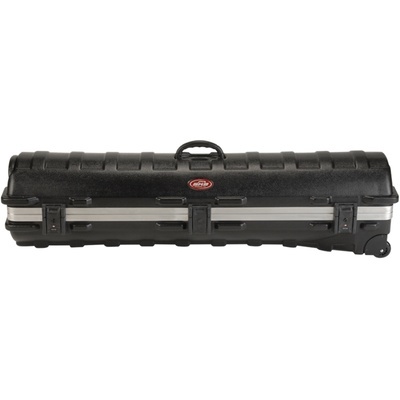 Our “Rail-Pack” stand cases are designed specifically for the secure transport of mic stands, drum hardware, and similar equipment that require a durable, practical, and appropriately sized transport system. These “Rail-Pack” cases feature vacuum-formed Polyethylene hard-shell construction, sturdy built-in wheels, cushioned rubber over-molded injection molded handles, oversized protective bumpers, and TSA recognized and accepted locking latches. All cases are certified ATA (Air Transport Association) rated Specification 300, Category 1, the highest standard for an airline transport container, assuring a minimum of 100 common carrier trips.